With the SalesLoft integration, you can push contact and company information directly from ZoomInfo Business Edition or ReachOut into SalesLoft to take action on. Ready to set the connection up? Follow the instructions below to learn how! Navigate to the Integrations tab and click Connect under the SalesLoft tile. A new window will populate, prompting you to sign in with your SalesLoft credentials. 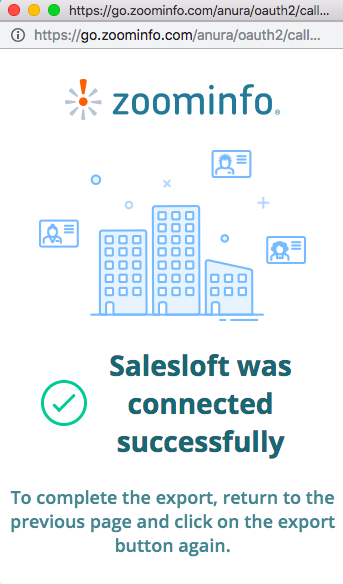 Note: to complete these steps, make sure you've connected to your SalesLoft environment. If you have not done this yet, follow the connection steps above! 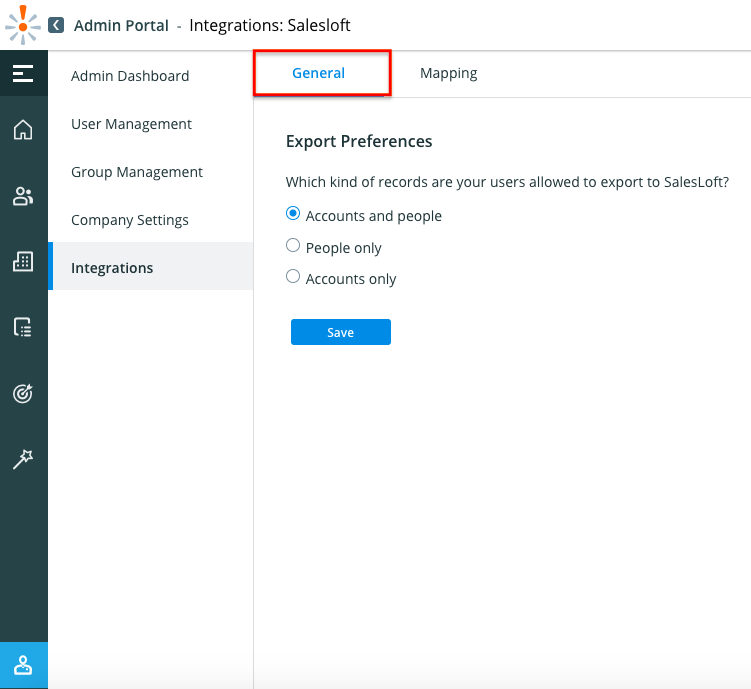 Within Admin Portal: Navigate to the Integrations tab and select 'Manage' under the SalesLoft tile. 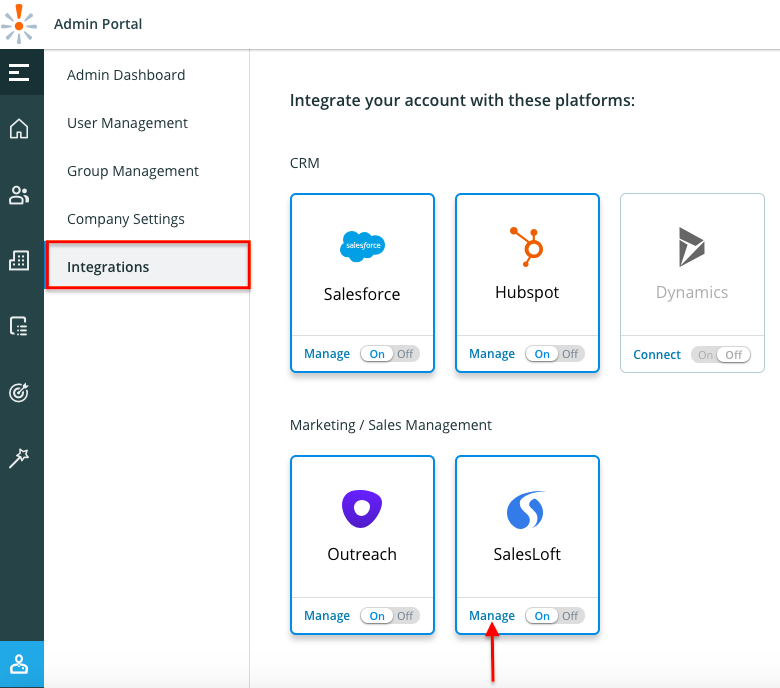 Within Admin Portal: Navigate to the Integrations page and click Manage under the SalesLoft tile. Click on the Mapping tab at the top left. Accounts & People must be mapped individually and they can be found directly below the mapping tab. Note: Any required fields within your SalesLoft will be marked with a red asterisk. The fields that are initially mapped are our default settings. To change these mappings, simply click the drop-down menu for that field. You can search for a field, type a fixed value, or select from the options of fields listed. If you receive an error message, check the field type in SalesLoft and how the field configuration is set with Salesforce to ensure the mappings you've selected in ZoomInfo align with your current configurations in SalesLoft. When users are exporting to SalesLoft, the Direct Phone will map to the Business Phone, but in the case that a specific contact does not have a Direct Phone then we will send the Company Phone to the Business Phone field.